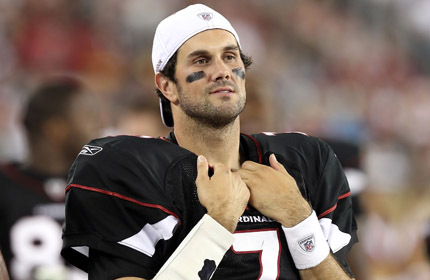 Once again entering 2010, Matt Leinart had the chance to be the starting QB for the Arizona Cardinals. Once again he failed, and this time it’s cost him a roster spot. The 10th overall pick of the 2006 NFL Draft out of USC, Leinart was told on Saturday that he would not be on the teams final roster, and will have the chance to look around the league for work elsewhere. Leinart had started 17 games over the last four seasons, completing 57.1% of his 595 pass attempts for 3,893 yards, with 14 touchdowns and 20 interceptions, compiling a 70.8 passer rating. Most of Leinart’s game action occurred during the 2006 and 2007 seasons before giving way to Kurt Warner. After two seasons as Warner’s back-up, Leinart was expected to ascend to the starting role this season. The Cardinals pursued competition for Leinart, and signed former Browns quarterback Derek Anderson to a two-year, $7.25 million contract in March. Anderson was named the starter for the team’s third pre-season game, a decision that Leinart griped about, saying he felt he had outplayed his competition this spring and summer. The Cardinals were shopping Leinart around the league, and gave Leinart permission to do the same, but no team was willing to take on his contract, which was to pay him $2.45 million this season, and $12.86 million in total compensation in 2011. With Leinart off the roster, undrafted rookie quarterback Max Hall will be the team’s backup quarterback. Matt started all of 2006 for Green. Matt didn’t take handle it well…or, maybe he did…if he felt he had to get away from Whis. Anyone who saw those first 2 preason games will tell you the entire team stunk….and especially the O-Line. Matt’s credentials with that line performance was heroic.